The U.S. Postal Service will finally see its payments into the federal employee pension account calculated using assumptions from its workforce specifically, rather than the federal workforce as a whole. The calculation has long been a sticking point at the mailing agency. USPS leadership has for years argued its payments into the Federal Employees Retirement System and the Civil Service Retirement System have been too pricey due to the difference between the demographics of its employees and the rest of government. Salary growth and workforce characteristics of the Postal Service differ significantly from those of other federal organizations. Postal workers generally remain in a similar pay grade throughout their careers while non-postal feds generally see their salaries increase significantly, and postal workers generally die younger than the rest of the federal workforce. The Office of Personnel Management finalized a rule on Wednesday allowing the Postal Service to make payments into the pension funds using a separate calculation based exclusively on its employees. 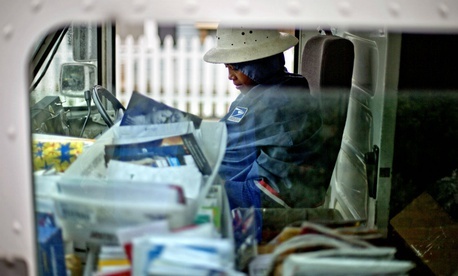 In comments to OPM on the proposed rule it issued in December, USPS and its inspector general asked for the Postal Service’s calculation to be uniquely based on both its workforce demographics and its wage growth. OPM opted to make the payment calculation specific to USPS for demographics only, saying the board that determines the pension liability will use salary information specific to the Postal Service and no rule change is required. While estimates have differed, postal reform advocates and the agency itself have said it has overpaid into the accounts to the tune of billions of dollars. A 2017 USPS IG report estimated USPS’ FERS liability has been overestimated by $4.1 billion due to a growing gap between the salary of the average postal worker and the salaries of other federal employees, among other factors. The actual amount is a moving target that fluctuates based on future projections. In its fiscal 2016 budget, the Obama administration said the USPS overpaid into the pension account by $1.5 billion. President Obama consistently called for the postal-specific calculation, as have numerous iterations of proposed postal reform put forward in the last several sessions of Congress. Those proposals have called for OPM to refund the overpayments back to the Postal Service. OPM said in 2012 it was legally required to make its calculation based on governmentwide, rather than postal-specific, calculations. The agency said in the proposed rule it made the change after reviewing a request from the Postal Service. A USPS spokesman said the agency is reviewing the final rule and had no further comment. Officials previously met with OPM after the agency issued the proposed rule to discuss its implications. The rule will also make additional calculations specific to each class of FERS contributor; federal employees currently pay one of three different percentages toward their pensions based on when they were hired, ranging from 0.8 percent to 4.4 percent of their paychecks. In 2013, Rep. Stephen Lynch, D-Mass., introduced a standalone bill to require OPM to create a postal-specific formula to determine its pension fund payments. Noting USPS’ fiscal difficulties, the agency’s IG has said, “The Postal Service cannot afford to make pension contributions that are not necessary for future benefits.” Advocates for the Postal Service have long called for the reform, with National Association of Letter Carriers President Fredric Rolando calling it a “nagging” problem. Postmaster General Megan Brennan cited pension overfunding as one of four key issues that had to be addressed for her agency to sign off on any reform effort. A bipartisan bill approved by the House Oversight and Government Reform Committee in March would codify the new rule for OPM to use postal-specific assumptions when calculating its FERS liabilities. If any surplus payments were detected after the new formula was established, the measure would be gradually refund that money to the agency.